Retinal detachment is a serious eye condition that happens when the retina peels away from the tissue at the back of the eye. Learn about the signs of a retinal detachment , why you should get it looked at quickly and the possible treatments available. Retinal detachment is a serious eye condition that happens when the retina peels away from the tissue at the back of the eye. If not treated quickly, it can lead to permanent damage to the retina – leading to loss of vision. Fortunately, retinal detachment is quite rare, affecting 1 in 10,000 people each year. It most commonly happens to those over 60, but can also occur because of trauma or genetic reasons. Detachment usually happens quite quickly, but there will still be warning signs before it happens. Because of how serious the potential complications are, it is essential that you do not ignore symptoms that match those of retinal detachment. Regular eye tests and examinations should help with early diagnosis, but staying aware of symptoms is also key. Floaters – Bits of debris that cast a shadow on the retina. The brain interprets these as tiny specks or streaks floating just in front of your eyes. Most people will likely have experienced floaters as they are quite common, and not usually something to be concerned about, especially if you’ve had them for quite a while. However, if you do notice a significant increase in the amount of floaters, this could be a cause for concern. Flashes of Light – Seeing short bursts of flashing lights in your peripheral vision can be a sign of retinal detachment. These lights occur when something other than light enters the eye and stimulates the retina. They are not always a sign of long-term issues, but if occurring in conjunction with other symptoms should be treated seriously. Blurring of vision – If you experience any blurring of vision or sight distortion together with other symptoms as described above, see your GP or seek other medical help immediately. Shadows/Loss of Vision – If you do have a detached retina, as the condition worsens you will notice a black shadow descending from the peripheral vision towards the centre of the eye, potentially leading to a complete loss of vision. Seek urgent medical attention if this is the case. Retinal detachment most commonly occurs when the retina develops tiny holes that allow vitreous fluid (the clear substance that fills the space between the lens and the retina) to leak underneath the retina. The pressure of this fluid pulls the retina away from the tissue at the back of the eye, detaching it from its blood supply. With this supply of blood removed, new cells die off and vision starts to break down. The reason these holes develop is typically due to the ageing process - Posterior Vitreous Detachment (PVD) is the process where gel is pulled away from the retina and occurs in a majority of people over 65. In acute cases it can lead to retinal detachment, but often it will not cause anything that serious. It can also occur because of a thinning of the retina, and in very short-sighted people, it is more likely as they are born with thinner retinas. In rare instances, the retina can be detached by a trauma to the eye, as a result of a blow or impact while playing sports. Some less common causes include conditions like diabetic retinopathy where scar tissue forms on the surface of the retina, which pulls it away from the tissue. Detachment can also occur without any holes in the retina, but because of swelling or a growth which applies a similar pressure as leaking fluid would. 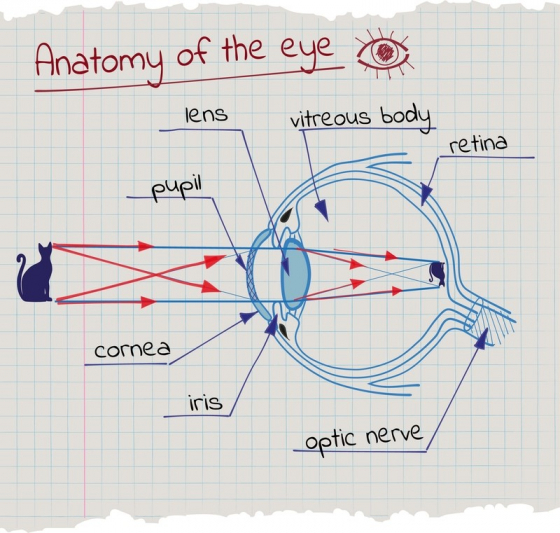 The retina is a light sensitive layer of tissue that lines the back wall of the eye. Information that enters the eye through the lens hits the retina and stimulates chemical and electrical impulses that are transmitted to the brain via the optic nerve. The photoreceptor cells on the retina are responsible for differentiating between colours and shades of light and dark. In the middle of the retina is the Fovea Centralis, which is a tiny depression that is tightly packed with cones (a type of photoreceptor cell) and is responsible for activities that involve highly detailed visual activity, such as reading and driving. Firstly, a doctor will ask about the various symptoms you have noticed to confirm that it fits the profile of a retinal detachment. Considering how potentially serious the complications can be, they should conduct tests on your eyes on the same day or within 24 hours. There are two tests for confirming a detached retina – an ophthalmoscope and an ultrasonography. 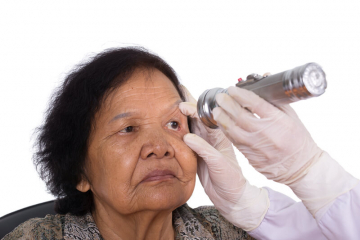 An ophthalmoscope test involves a doctor using a piece of equipment with a bright light and a lens, which lets them see the entire inside of the eye in very high detail. This allows them to observe and analyse any tears, holes, or other defects in the retina and conclude as to how serious the damage is, and what can be done. An ultrasonography is an ultrasound test where sound waves are bounced off the eye, recorded and shown in visual form on a monitor. These waves give a full 3D picture of the eye, allowing a specialist to observe holes and tears, and diagnose. They will diagnose the type of detachment you have whether it is the most common type, mentioned above where tears and holes allow fluid to build up pressure behind the retina; secondary detachment, where it is caused by inflammation or a growth, or the result of some kind of trauma. 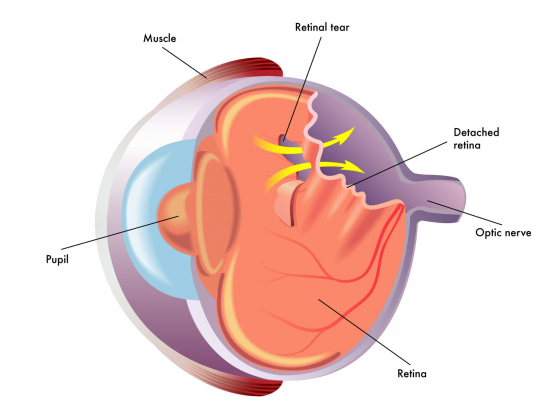 Retinal detachment tends to only occur in one eye, but there is a slightly heightened chance of developing it in the second eye, after a previous occurrence. The treatment for repairing a detached retina always involves surgery, without it the condition will certainly lead to loss of eyesight in the affected eye. There are different types of surgery that can be used depending on the nature of the detachment and any other complications, such as different eye conditions. Prior to the operation most people will be given a local anaesthetic, where just the eye is numbed, others may need a general anaesthetic depending on the situation. Vitrectomy – The most common of the surgeries, vitreous gel is removed from inside the eye and in its place either a gas bubble or silicone oil will be injected into the eye to hold the retina in place. It will be necessary to hold your head in a certain position for a period of time after the surgery to allow the bubble to settle in place. If the doctor uses silicone oil, it will need to be removed at a later date as unlike the bubble, it will not dissipate by itself. Pneumatic Retinopexy – If the detachment is minor and does not have any complications, a small gas bubble is injected into the eye to push the retina back into place. Cryotherapy or laser treatment is then used to hold the retina in place for the long term. ‘Posturing’ where the head is held in a certain position is also required. Retinopexy is reportedly far less successful than the other surgeries available, and is therefore used less frequently. Scleral Buckle – Silicon bands are attached to the outside of the eye, the resulting pressure on the outside pushes the inside of the eye to move in slightly (hence the ‘buckle’). This will help the retina move back into position, followed by some cryotherapy or laser treatment to hold it in place permanently. The bands are usually left in place, but are not visible. Deterioration of the original detachment. In rare cases – infection or allergic reaction to medication. What is the Prognosis for Retinal Detachment? In 85% of cases, the first operation will successfully reattach the retina, sometimes a second operation will be needed. The prognosis is generally very good, although it may take weeks or months for vision to return fully. Depending on the severity of the detachment and how long it took to be repaired, vision may not return to the same level as it was before. The longer the retina is detached, the greater chance there is of suffering permanent damage to either the peripheral or central vision. If posturing is part of your recovery process, it will naturally prevent you from doing certain activities, once this is completed it should be possible to return to things like driving or work. Assuming your other eye is relatively healthy, in the long term it should compensate for any deficiencies in the other eye. In the long term you may need to discuss with your eye doctor what activities you can and cannot do going forward. There maybe be other ways that the health service can assist in recovery, such as offering counselling or referring you to organisations which can provide advice on equipment and lighting that help those with poor vision.